I’m not sure I understand why Lady Justice wants him more. I suppose it has something to do with my gut not lining up here on depravity; a sadistic psychopath has a few screws loose, reducing his responsibility, whereas a husband killing his wife has forsaken a sacred vow he made and betrayed one who should have been able to trust him. Lady Justice’s primary concern is the protection of society. You can make the argument that the psychopath is less morally culpable, but nevertheless a more depraved criminal is more dangerous to society at large. The rates of recidivism for a simple murder such as in the first case are really quite low. Sadistic killers, on the other hand, generally don’t stop killing until they’re dead or in prison. Not sure we want ‘sacredness’ recognized as a legal matter, alleged deities are notoriously hard to get into the witness box. Seems to me you’re assuming that the depraved killer is mentally ill because of the depravity of the crime – that’s a kind of circular reasoning to my mind. Some people who would otherwise not be considered insane are capable of extremely depraved acts. Further in the case of the sadistic killer a much greater level of forethought is required when compared to the husband, in a moment of uncontrolled rage, inflicting a single but fatal wound. Preparation would be necessary even if just in terms of selecting a victim. There’s also the issue of protecting society as Justin Reilly already mentioned. Finally I think that there is a possibility that if highly depraved crimes were thought to automatically be the product of mental illness and to reduce culpability then we’re in effect encouraging people to commit increasingly depraved crimes. Ahh, 3-dimensional graphs! I have an immediate urge to take a random sample of recent crime data and plot it as a ‘crime cloud’ here, with each crime plotted as a sphere coloured to represent the act and with a volume representing the severity of the sentence given. By comparing these clouds across several countries we could get an idea of the weighting each’s legal system gives to different factors upon different crimes and… I must stop myself before I get carried away! The U.S. Bureau of Justice Statistics has tons of raw data for this country, anyway — and plenty of compiled reports. Not everything is reported the same by every state, so some data sets aren’t as complete as I would like, but it’s a start. I wouldn’t be surprised if other countries kept similar data. Super late to the party, and IANAL, but isn’t ‘depravity’ only a partial component of the ‘third axis’? I feel this axis represents a utilitarian aspect of the law. Put another way, it’s what society uses to calibrate its level of retribution. I think it’s more complete to label this axis ‘degree of harm’ (harm caused to the victim + harm caused to society). So, for the psycho killer guy, he gets a stiffer punishment because he has caused greater harm to the victim (greater suffering) and to society (which is how I interpret ‘depravity’, in that society is sort of ‘psychologically harmed’ by the horrific nature of the crime, especially those that know the victim personally). Without the individual component, we’d have much harsher punishments for, say, stealing candy for a baby (a fairly ‘depraved’ act, but causes very little harm to the victim). Conversely, without the societal component (i.e. 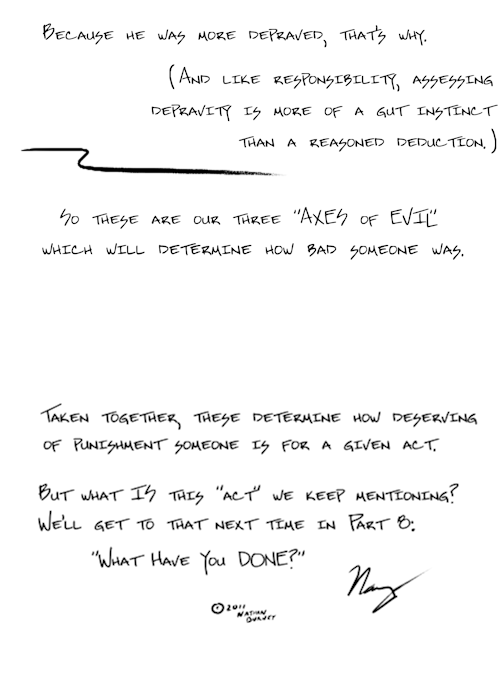 ‘depravity’), we’d have much lighter sentences for ‘victimless crimes’ that cause great harm to society (e.g. treason). Yeah, these are just for culpability, how much the person can be blamed for what they did. Also using a slightly different sense of “depravity.” Taking candy from the baby or committing treason are both crimes in the basic sense, no amount of “depravity” applies to either. Depravity is the difference between slipping the candy away from the baby when they’re not looking or snatching it away and taunting them with it. Depravity means you went the extra mile to make it nasty, and it stands separate from what, exactly, you made nastier.